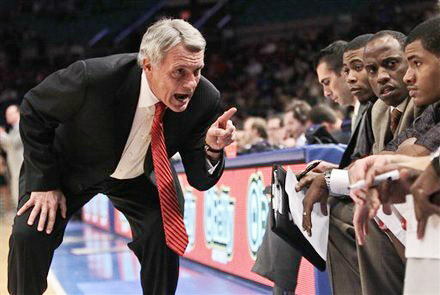 #5 Pittsburgh (Panthers, 28,328 students, Pittsburgh, PA) 79, MARYLAND 70 – No doubt, former Clemson coach Oliver Purnell is feeling Gary Williams’ pain. For years, Purnell’s Tigers lost important close games by slim margins while throwing rocks at the rim from the charity stripe. Right now, based on most of last night’s performance against the highly ranked Pittsburgh Panthers, Williams Terps appear to be talented and, for the most part, coachable. What they can’t do – and it will be a huge liability later in the season if they don’t get it fixed – is shoot free throws. Last night while losing by nine at MSG, Maryland (3-1) was 0-7 from the free throw line in the first half. Yes, not a misprint – Oh-for-the-first half. Ouch. They did manage to make 14 of 23 in the second half, but that’s an unimpressive 60%. The Panthers shot 70% on the freebies for the night. Panther freshman Talib Zanna had 14 points and 12 rebounds to Pitt and Cliff Tucker’s 17 points topped the Terps. #8 NORTH CAROLINA 107, Hofstra (The Pride [formerly the Flying Dutchman], 12,300 students, Hempstead, NY) 67 – Remember when Carolina used to run up and down the court like a track team and score in triple figures? Fans complained about their defense but it didn’t matter ‘cause the Heels were happy to simply outscore the other team. Well, after a season when they rarely hit the 100, or even the 90, point mark, it looks like the old high octane Tar Heels (3-0) may be back. That said, it probably wasn’t the 100+ points against on overmatched Hofstra squad that pleased Ol’ Roy the most. The stat he had to be pleased with was that his point guards produced 15 assists and just three turnovers. Harrison Barnes lived up to the hype scoring 19 points while going 4 for 4 from behind the arc in the first half. Leslie McDonald scored 16 points and Justin Watts added 13 for the Tar Heels. John Henson had 12 points and 11 rebounds. UNC outrebounded Hofstra 50-29. N.C. STATE 85, East Carolina (Pirates, 27,816 students, Greenville, NC) 65 – Lorenzo Brown had 16 points and Scott Wood 13 as North Carolina State (2-0) used a 42-10 run to blow out state rival East Carolina at the Charleston Classic on Thursday night. 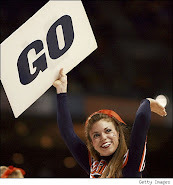 Yale (Bulldogs, 11,593 students, New Haven, CN) 75, BOSTON COLLEGE 67 – Rumor has it that the boys in Charlotte are considering some sort of sanction against the Eagles (2-1) for losing a basketball game to an Ivy League team. Expect yet another of those oft-passed around Hitler videos “Mein Fuhrer Learns That Boston College Has Lost” but the actor playing the former Nazi supreme commander is really ACC commish John Swofford. FLORIDA STATE 89, FIU (Golden Panthers, 40,445 students, Miami, FL) 66 – Deividas Dulkys scored 22 points to lead Florida State (4-0) while leading scorer Chris Singleton, who entered the game with a 21-point-per-game average, finished with 14 points and an impresive 13 rebounds. 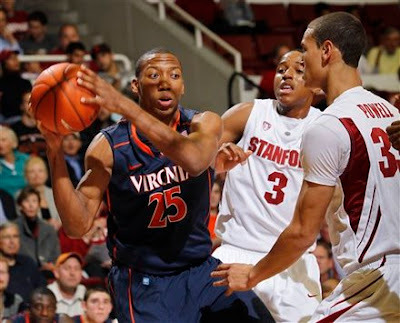 Stanford (Cardinal, 15,319 students, Stanford, CA) 81, VIRGINIA 60 – Jeremy Green scored 21 points in leading Stanford to its sixth consecutive victory over Virginia on Thursday night. Freshman Anthony Brown added 13 points for the Cardinal (2-0), which had five players reach double figures in scoring. Mustapha Farrakhan had 14 points to pace Virginia (2-1).